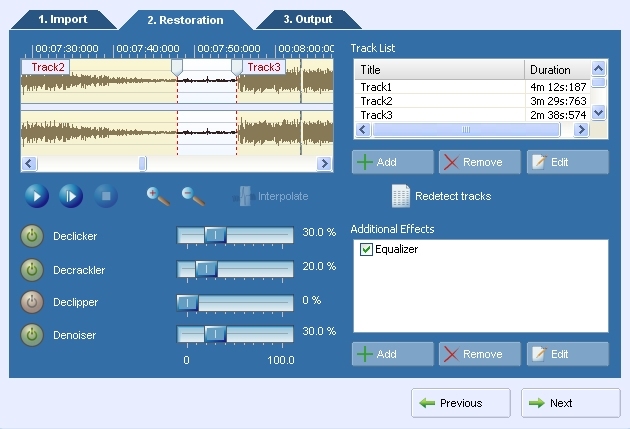 AudioLava is the ideal solution for restoring and recording high quality audio from LP to CD. AudioLava automatically removes noise such as tape hiss or clicks and crackle on LP records. The user friendly Cleaning Wizard guides you through all the steps from recording and track splitting to restoration and CD burning. The digital emulation of phono preamplifiers eliminates the need for an external phono preamplifier. Qweas is providing links to AudioLava 1.0 as a courtesy, and makes no representations regarding AudioLava or any other applications or any information related thereto. Any questions, complaints or claims regarding this application AudioLava 1.0 must be directed to the appropriate software vendor. You may click the publisher link of AudioLava on the top of this page to get more details about the vendor.